Even through Chicago Midway International Airport is near one of the biggest airports in the world located at Chicago O'Hare Airport it is not a small airport by no means. 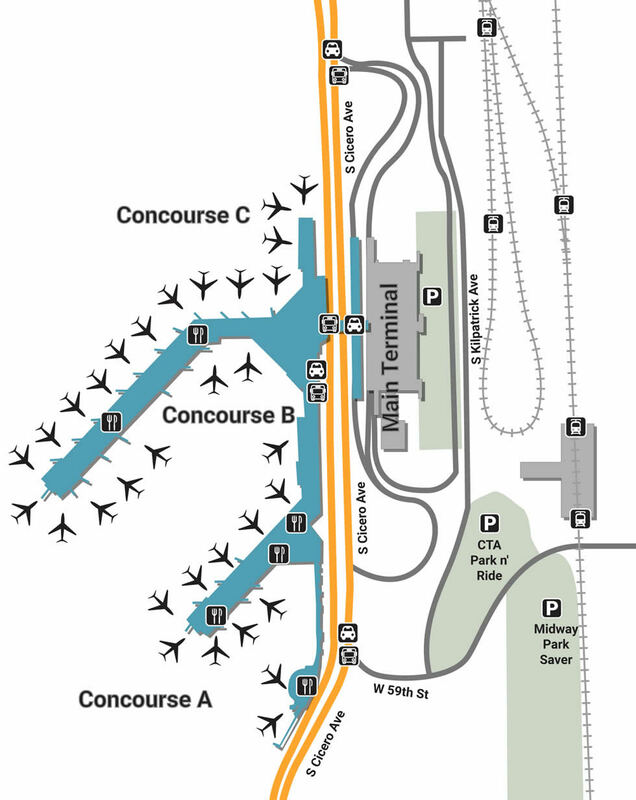 So getting around the terminals can be hectic so getting an overview of the airport can help. Famous for being Chicago’s former airport, Midway International is a ways from downtown and a lot less busier than O’Hare Airport, allowing guests to truly relax. With only 5 runways, the facility is relatively dead most of the time, but still maintains a lively atmosphere with tasty restaurants, unique guest services and interesting stores. Located between 55th and 59th street, parking takes up 3 locations along Cicero Avenue, offering great convenience to downtown as well as the airport. If you’re just planning on staying for a few hours for a conference, utilize hourly parking on the 1st floor of the Parking Garage, east of Cicero Avenue. Floors 4, 5, and 6 are for Daily Parking while Level 2 is a pick-up/drop-off zone for shuttles and private transportation. For those that are picking up a family member, free temporary parking is available at the Cell Phone Lot, located at 61st and Cicero Avenue. Midway offers a variety of services to their guests, from disabled parking at every lot to helpful translators at Travelers & Immigrants Aid, located on the upper level of the terminal. One of the most beautiful parts of the entire facility is the Midway Airport Chapel, a universal church located on the Mezzanine Level at Concourse C. In addition to travel facilities, there are also simple business accommodations like free Wi-Fi and laptop terminals that come fully loaded with outlets, seating, and a roomy work station. Explore the many shops and boutiques throughout the airport, all of which make waiting a pleasurable thing to do. Get official Bulls, Blackhawks, and White Sox apparel at Chicago Sports, located by Gate A, or browse through the large collection of DVDs, CDs, and special gadgets at George’s Music Room in the same area. If you need to get a special gift for someone waiting on the other side, grab the perfect card at Viva’s Hallmark, located at Gate B2, or you can get a special souvenir for your sweetheart at the very-busy Chicago Treasures. There’s tons to do when you arrive to Chicago, which is exactly why so many local restaurants fight over traveler attention at Midway Airport. Enjoy the food at Midway Triangle, the airport’s largest food court, which includes classic bistros like Hudson’s Euro Cafe as well as Chicago treasures like Illinois Bar and Grill. Located in Concourse A are a variety of eateries, including McDonald’s, Dot-Com Cafe, and a classic bar, Halstead St. Tap. If you’re interested in classic American entrees at a low price, head to Oak Street Beach Cafe for a breakfast and lunch you’ll never forget.